Enzymes are tools of nature that accelerate almost all biochemical reactions in living cells as biological catalysts. For this reason, enzymes have been used in the chemical industry for some time now - in detergents and cleaners, toothpastes and shampoos, but also in foods. Enzymes help in the production of paper, textiles, leather, medicines, biofuels and other products. Biochemically, enzymes are proteins that are composed of natural amino acids. They form a three-dimensional structure. Just like a key fits into a lock, each specific molecule fits into an enzyme and the enzyme converts it into a new product. Technically, it is possible to exchange individual amino acids in an enzyme and thereby change its structure so that it can now process other molecules. In this way, British scientists have created just recently a mutant enzyme that breaks down plastic. Chemists from Julius-Maximilians-Universität Würzburg (JMU) in Bavaria, Germany, have now gone a step further in the tailoring of enzymes: "We thought what fascinating possibilities would arise if we could change the surface of enzymes chemically and use the chemical space of molecules," says Jürgen Seibel , Professor of Organic Chemistry at the JMU. "We have developed a reaction that does not occur in nature in this way. 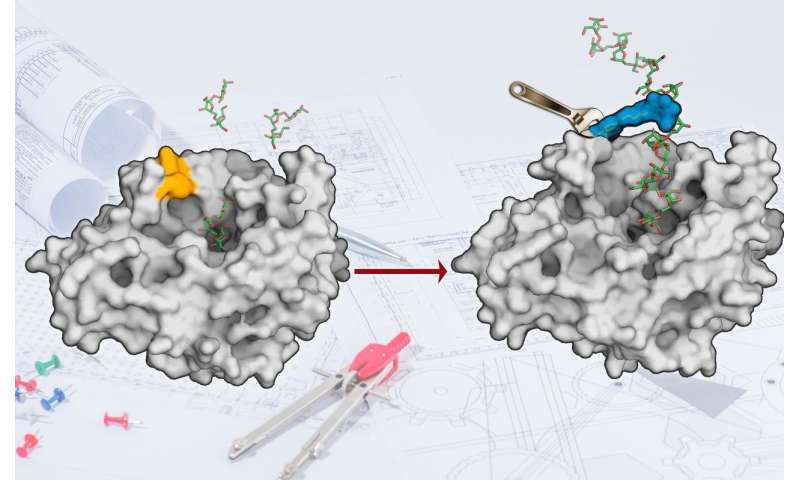 It gives us a lot of freedom in reshaping enzyme surfaces. " As the JMU scientists report in the journal Chemical Science, they first redesigned the surface of the enzyme levansucrase. Now, the enzyme can convert the table sugar (sucrose) directly into a polymer of fructose building blocks. "So far, such a synthesis has been possible with levansucrase, but it works much more efficiently with the modified enzyme," explains Seibel. The conversion of the enzyme per second is now significantly higher; moreover, it mainly produces the desired product and no accidental by-products. The fructose polymer could be used as a bio-gel for tissue transplantation in medicine or in the food industry – for example as a probiotic supplement in yogurts or baby food. Because like other functional sugars, the polymer could also serve certain intestinal bacteria as food and indirectly exert a health-promoting influence on the intestinal flora of humans.